i painted all the scan and i made the hair with so many highlight =D and the eyes were really hard (please full view it) there're alot of details on it :**[ even the mouth , i was wanted it to look shiny.. but i couldn't.. >o<"
Very nicely painted! I love the hair! Was it done in Photoshop? The eyes are really nice, great job with those. I think the main problem with your painted lips is the shine blends in too much with the rest of the lip like skin shading instead of glossy white shines like eyes. Also, the hair looks kinda stiff compared to the original (it's a bit straighter in places... subtly), and much duller. Same deal with lips, it'll look better with more contrasting values. Oh Gosh! Finally I found a suitable wallpaper for my desktop! Blurring the BG surrounds her gives a wonderful touch! Nice. Thanks for doing this wallpaper. You did very good, thanks for uploading it. Tifa looks amazing. You did a good job with this. It certainly caught my attention. 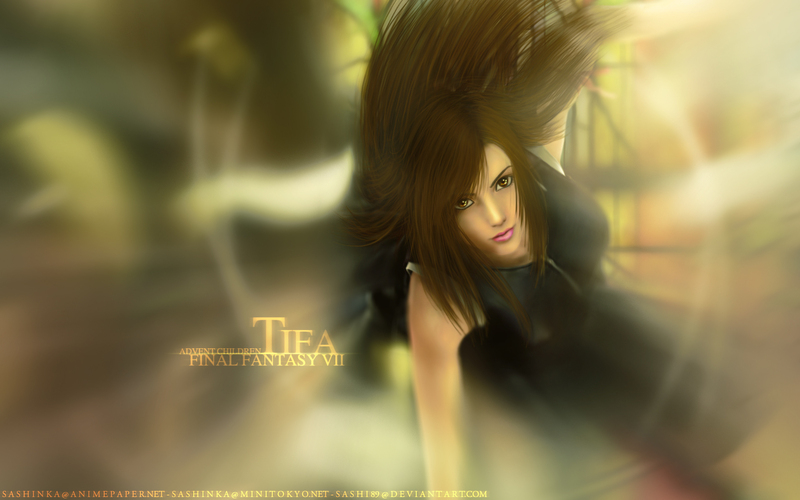 Tifa looks really cool.